The US drug reform movement lost a leading light this week. Ron Crickenberger, who as the Libertarian Party's national political director from 1997 until a few months ago made ending drug prohibition a central plank in the party's platform, died of metastic melanoma (skin cancer) at Sibley Memorial Hospital in Washington, DC, on Tuesday less than two months after being diagnosed with the disease. He was 48. With Crickenberger at the helm, the number of Libertarians holding elected office more than tripled, from 180 to about 600, and the party set new records for candidates on the ballot in both 2002 and 2002. Crickenberger himself was one of that number in 2000, when he campaigned for Congress in his home district in Northern Virginia. "Ron was definitely an inspiration to everyone," said Troy Dayton, a drug reform activist who had worked with Crickenberger on Libertarian fundraising operations. "He worked so hard on issues of freedom, and he had a great sense of how all those issues intertwined. He was the one person most responsible for making drug policy the central issue for the Libertarians, and he worked tirelessly to ensure that the party worked closely with the various drug reform groups," Dayton told DRCNet. "He was the lead person in the party to make drug reform and drug policy such a big issue for the party," concurred new DanceSafe (http://www.dancesafe.org) executive director Marc Brandl, who worked under Crickenberger as party national campus coordinator. "We had a drug war task force spurred by Ron, and he led the successful campaign to defeat Bob Barr," he told DRCNet, referring to the 2002 Republican primary election campaign where the hard-line drug warrior was rejected. In that campaign, Crickenberger teamed with medical marijuana patient Cheryl Miller -- who passed away herself in June -- to create television ads featuring a bed-ridden Miller asking, "Why do you want to put me in jail, Bob?" "Ron was almost single-handedly responsible for making that happen," said Brandl. "He wanted to do a lot more with the strategy of un-electing legislators who threaten our freedoms. But now he's gone, and I'm sort of in shock, and I feel sort of down in the dumps. I saw him at DPA in November, but I never really had a chance to talk with him then." In addition to fulfilling his duties as Libertarian Party national political director, Crickenberger had been a fixture at anti-prohibitionist events and demonstrations, both in Washington, where the party offices are, and at events around the country. DRCNet was a beneficiary of such efforts on Crickenberger's part, according to DRCNet executive director David Borden. "Ron traveled all the way to New York for a two minute speaking slot at our Perry Fund kickoff; and he made it out early on a cold winter morning to speak at my jury civil disobedience rally, even though we knew it would be small and mostly for practice." Crickenberger at DRCNet's jury refusal "practice demo"
Crickenberger also showed up at the Justice Department in June 2002, when, with a handful of other Washington-based activists, he had himself arrested for blocking the doors to the Justice Department to protest federal raids on medical marijuana patients in California. "We're here to focus public attention on this issue," he said at the time. "Marijuana is one of the most benign therapeutic substances and it makes no sense for the federal government to be prosecuting patients who use it." "Every protest I've been to in DC, Ron was there," said Dayton. "Not only did he run the national Libertarian movement, but he did what every activist in the country needs to do -- calling legislators, showing up at protests, putting signs on your car, all that kind of thing." He had a sense of humor under pressure, too. "When we were arrested at the Justice Department and they put us in the holding tank, it was pretty tense," said Brandl. "But then Ron broke into 'Folsom Prison Blues' and got everybody laughing." Crickenberger also had a personal life, which he shared with his partner of 12 years, Noelle Stettner, at their home in suburban Falls Church, Virginia. "Ron was positive to the last, even though these last two months were torture," she said. "Where other people might have given up, he was fighting to live. He wasn't ready to go yet," she told DRCNet. Crickenberger has two adult children, she told DRCNet, and a week-old granddaughter. "He got to see her before he left us," Stettner said. Stettner also related how she and Crickenberger met. "It was through sci-fi," she said with a hint of a smile in her voice. "We were both geeks." The Libertarian Party announced Crickenberger's death on its web site Tuesday. "The quest for liberty -- everyone's liberty -- was Ron's passion," said Steve Dasbach, who worked with Crickenberger as the party's executive director from 1998 to 2002. "His enthusiasm was contagious, infecting thousands of Libertarians with the desire to run for office, volunteer for campaigns, and willingly contribute their hard-earned money to the cause of freedom." Crickenberger had worked his way up the party ladder after first becoming interested in libertarian issues as a small-businessman in Georgia, the state where he grew up. "It was taxes and regulation, not drugs, that got Ron started," said Dayton. 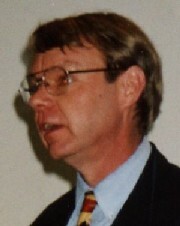 Crickenberger managed a winning Libertarian Party city commission campaign in Georgia in 1995, served as state party chair after that, and was a member of the party's national committee before joining its Washington staff. But Crickenberger was ousted from his position with the party last fall in what one observer delicately called "differences over vision and finances." Stettner had blunter words. "It was a bunch of infighting, and they made a bad decision, and I think it contributed to his death," she said. "Doing that job was his calling, and when a man is fired from a job he believes in like that, it affects him. He was outwardly positive, he was always outwardly positive, even about his illness, but he was forced out, and I think he was depressed about that." Crickenberger's emphasis on the drug issue grated on some in the party, Stettner said, but he thought it was too important to ignore. "Ron thought it was stupid to run away from that issue because it upset a few people in the party," she said. "He felt like public opinion was already on our side and we could win. It could be our wedge issue. If we didn't get out front on that issue, someone else would. This could be part of the reason he was no longer with the Libertarian Party," she said. But Ron Crickenberger was still plotting new battles when he died. He and Stettner were preparing to return to Georgia, where he had taken a position with Georgia Advocates for Self Government, a group that pushes for an expanded awareness of the libertarian philosophy. In line with this last twist in Crickenberger's vibrant and all-too-brief political career, his family is requesting that donations in his name be sent to: Advocates for Self-Government, The Liberty Building, 213 South Erwin Street, Cartersville, GA 30120, or http://www.theadvocates.org online. The New York LP has set up a page for people to leave their thoughts about Ron as well as some pictures of him, including his CD arrest for medical marijuana at the Department of Justice in 2002 at http://ny.lp.org/cgi-bin/condolences.cgi?Ron and more pictures at http://ny.lp.org/images/ron.htm online.